And this is just a small, small sampling selected by yours truly. Go to Chris’s website and BlogBook to see about a zillion more (after reading the illuminating interview below). I know. Amazing. So how did you get into underwater photography? I was an amateur photographer and got the idea that I wanted to take a person’s picture underwater. I bought a plastic EWA bag for an old Canon 35mm and did breathold photography in a friend’s pool. Didn’t do so well and thought if I was on SCUBA I would have more time to compose and frame, so I went to a dive shop asking for air, learned that I needed to be certified, took the course, got the air and off I went. At this point I have over 5,000 logged dives with only seven without a camera. 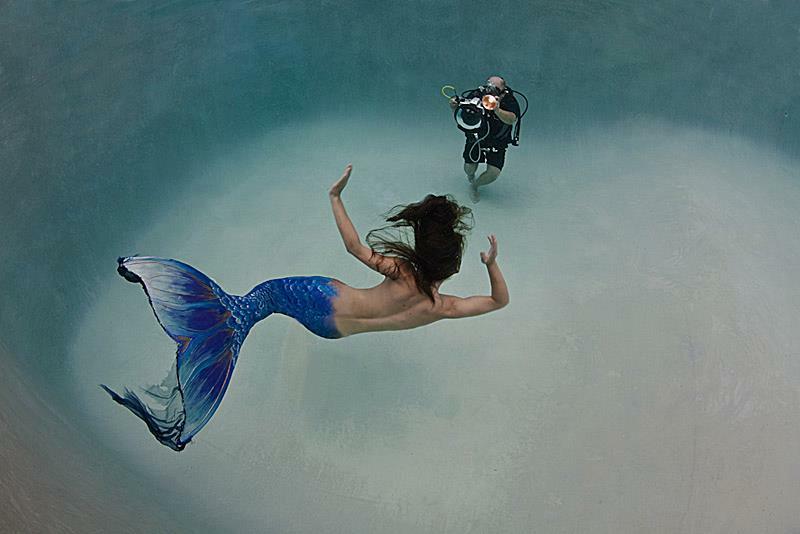 When did you start photographing mermaids? Working with Sherry Smith in Mexico or Turks & Caicos Islands, we talked about doing something different than standard underwater photographer and model things. She went back to Illinois and talked to a college fashion design professor who sketched some “costume” designs and gave me a quote to make the choice. Where—and from whom—do you get your tails? I use eight tails. Tail #1 was conceived by model Sherry Smith and me, then designed by a fashion design instructor at the University of Southern Illinois. The instructor sent me several sketched designs, I picked one, she quoted doing the fabrication using Sherry for sizing. It was fabricated using 3/16″ neoprene with sewed-on scales and a fluke over two swim-fins epoxied together. Tail #2, 3 and 4 were fabricated similarly, but in two pieces, with a neoprene torso and a painted monofin. Tail #5 was made of latex rubber by Adam Martyn, Carpathian Creations, in Budapest, Hungary. It is an attractive tail but had some issues that made us dedicate it to dry use. Tails #6, 7 and 8 are silicone tails by Eric Ducharme (the Mertailor). They are by far the best of all tails I’ve used. Tail#6 was used for the cover of Mermaids & Mythology magazine (blue-green color). Tail#7 was used for the Hasselblad Europe new product announcement (see hasselblad.com 60 megapixel product launch; goldfish color). Tail#8 is black and was used for the Evil Mermaid images. 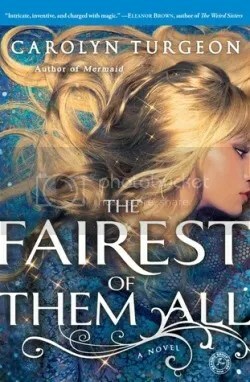 Can you talk about some of the challenges of working with mermaids? The major challenge is finding someone who is uber-comfortable in water, has reasonable breathhold ability, and is able to relax his/her face, swim gently like dolphin, fit one of my tails and love it. I developed and teach underwater modeling and photography, so I’m used to coaching and helping a new photo-mermaid build his/her skill set. Have you always been fascinated by/attracted to life underwater? Yes, I was born in Savannah, Georgia, and have been “water person” whole life. How would you describe the allure of the sea and its denizens (mermaids)? I’m attracted to pretty much all things of the oceans. 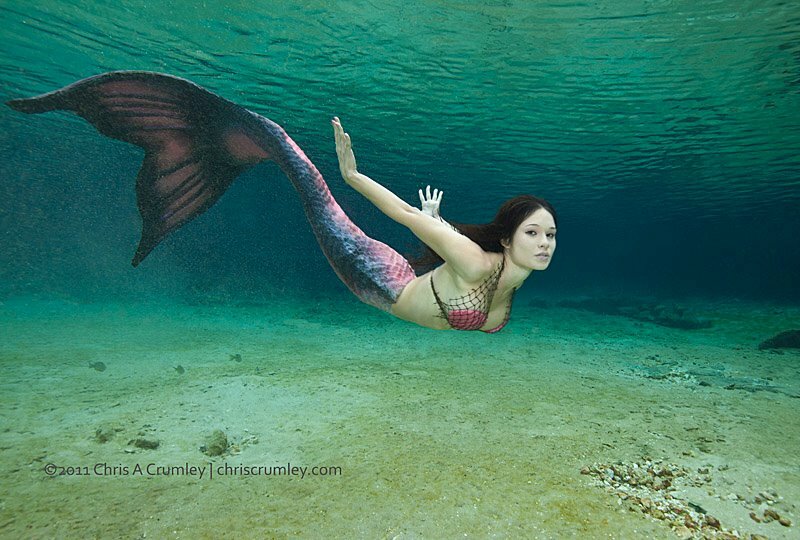 I’ve photographed whales, whale sharks, sharks, people, shipwrecks and, now, mermaids. 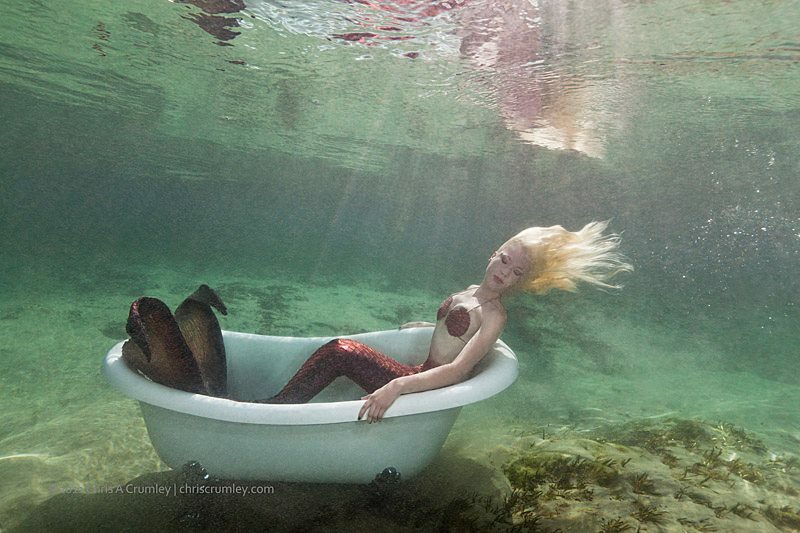 Can you tell me about some of your more interesting and adventurous mermaid shoots? I just returned from the Florida spring-fed rivers shooting. One project was to put a clawfoot bathtub in the Weeki Wachee River. I’ve also photographed a mermaid with wild spotted dolphins on the Bahama Bank off Grand Bahama Island, Bahamas. How do the ideas for these shoots come about? There is no one way. Sometimes I just have a mental picture for a new image. Other times, I’ll see an unrelated image that appeals and it inspires me to do something similar with a mermaid theme. Or, a model/mermaid will suggest something. A good example of this is the “Evil Mermaid” idea. A couple of my models wanted to do the “Evil” theme. However, it’s a fun Evil, not ugly Evil. How did the clawfoot tub shoot come about, and how did you make that happen? I saw a clawfoot tub at a local Lowe’s hardware store and took a snapshot of it, then designed an image and did a mockup. I borrowed tubs from plumbing suppliers (see credits here) and shot in studio during cold months (see this photo and others in the BlogBook). Then I shot on beaches and islands (see this image + this one), shot in a pool, and shot in central Florida spring-fed rivers (see this photo and others in the BlogBook). This is still an ongoing project, and I’ve been working with various models, the PR agency for the tub manufacturer, and others. 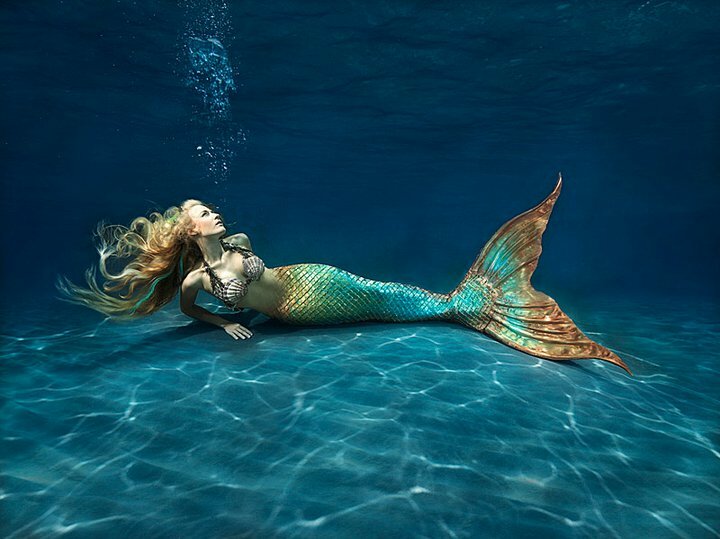 Do you have any advice for photographers hoping to capture mermaids on film as beautifully as you do? The first thing is to develop a skill for taking photographs underwater. There is lots to learn before being able to produce something of high quality. Also, it is an equipment-intensive endeavor (camera, underwater housing, lights, mask, fins, scuba, etc.). Then, acquire a realistic tail and accessories (tops, jewelry, etc.) and/or a “mermaid” who has his/her own tail and experience modeling. Do you have any advice for mermaid models, and aspiring mermaids generally? This probably goes without saying, but you have to love it, and then start working on the skills you need, which I mention above. Then, find a photographer and connect. Go shoot and keep shooting. You must keep trying new and different things to develop a portfolio of quality images. Oftentimes, this means traveling for both. Not often is there a tail, a mermaid, suitable water and an mermaid-keen underwater photographer all in the same town/city. So mermaid makeup is obviously very important to mermaids trying to look their best, and what mermaid isn’t? Luckily, they not only have the glamorous Carmindy to give them tips, but a whole line of natural makeup and skincare products made just for them. Mermaid Minerals was started in 2010 by Patti Oriot, and features all kinds of appropriately waterproof and sun-protecting and glittering products. There is even a “face of Mermaid Minerals”—Weeki Wachee‘s Kylee Troche was the face of 2011—and right now Patti’s looking for the face of 2012 and aspiring mermaids everywhere are posting their photos on her Facebook page. So obviously you should get your mermaid mug up there, after reading the following gorgeous Q and A. So Patti, what are Mermaid Minerals? 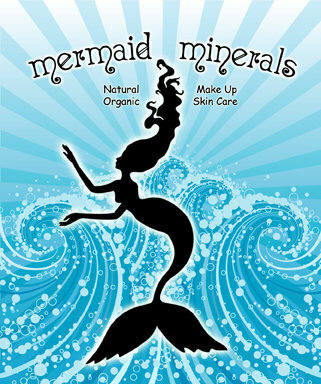 Mermaid Minerals is my line of natural & organic make up & skin care. The line also includes products for hair, men & children. Many more products are set up for debut soon as well. The line just keeps growing! Every item in my Mermaid Minerals Make Up & Skincare line has been tested and approved by a board of licensed estheticians, aromatherapists, and a team of cosmetic formulators & chemists. Beauty is a characteristic, being in balance and harmony with nature. My product formulas are infused with natural earth made ingredients. Toxic chemicals were left out to bring you quality products to protect and preserve your skin. I was living in Maui and working my regular day job and went to the local health food store to get some beauty products. Living on an island you have limited resources and things tend to be very expensive. I had gotten used to that but aside from shipping I thought that many products were over priced and over packaged. I got the idea to start my own line. Besides wanting to offer a quality product that was affordable, I wanted to include my island influence to the products as well. Many of my products have rare Hawaiian red sea algae in them. The entire process for starting the business started about five years ago! I finally got it to market the summer of 2010. What does makeup have to do with mermaids? Everything! Ah ha! I was about five years old living in St Petersburg, Florida, and my mom took me to Webb City. This was a multi-story drug store and in the basement they had an arcade and are you ready for this? A entire MERMAID land! Yes, several mermaids sitting around perched on rocks that you peered at through big windows. I did not know at the time that my Mom had told them my name in advance! So when a Mermaid said, “Hello little mersister” I truly thought that I was a Mermaid! So ever since that day Mermaids have been a part of my life, I have collected them, drew them, read about them, seen them and lived with a Mermaid influence my entire life. So, naturally my business has a Mermaid association. Mermaids have a unique make up & skin care need as well. First of all they need make up that stays on underwater! Secondly, they need good skin care products to compensate for all those hours in the water! Many of my products are waterproof without harmful chemicals. How can an aspiring mermaid get that “mermaid look”? There really isn’t a “mermaid look.” I encourage all mermaids to develop their own style. However there are some basic make up application tips that I can share! Applying an eye base will keep your shadow from slipping and creasing up. I have a magical product that is a clear liquid that turns any loose eye shadow into a waterproof eye lid or eye liner formula. It is called ILINE Plus and is only $9! Apply my waterproof LIP SEAL over your lipstick to keep it on while blowing mermaid kisses underwater! 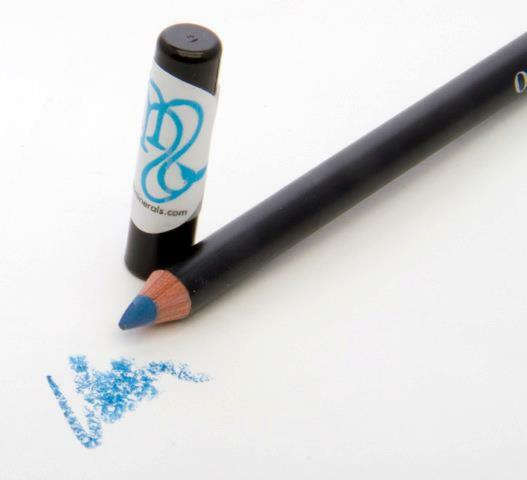 The eye brows frame your face so using my waterproof eye brow pencils will ensure a picture perfect frame for your eyes. Mermaids are photographed a lot and it helps to have a little extra makeup up on to show up in the photos, especially if they are underwater shots. Sparkle is a must for mermaids! 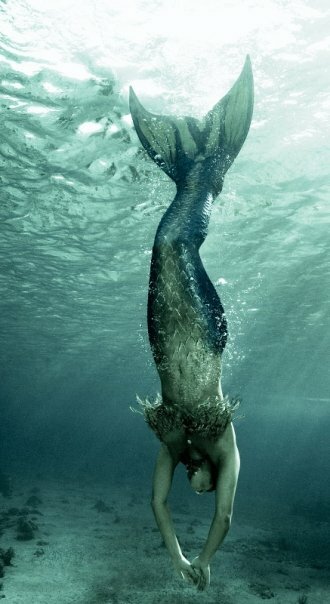 Most mermaid tails glisten and shine and shimmer. Your face should mirror the same look. Never ever use craft glitters! They can permanently damage your eyes if the glitter particles get in your eyes! This is something to never risk. All of Mermaid Minerals eye and body glitters are safe cosmetic grade. I also have a fixative to apply the glitter with as well to keep it in place! It is a gel like formula. Goes on easy on the eye lids. Do you have a face of Mermaid Minerals? Can you tell me about that? I wanted to feature a face that mermaids everywhere could relate to. 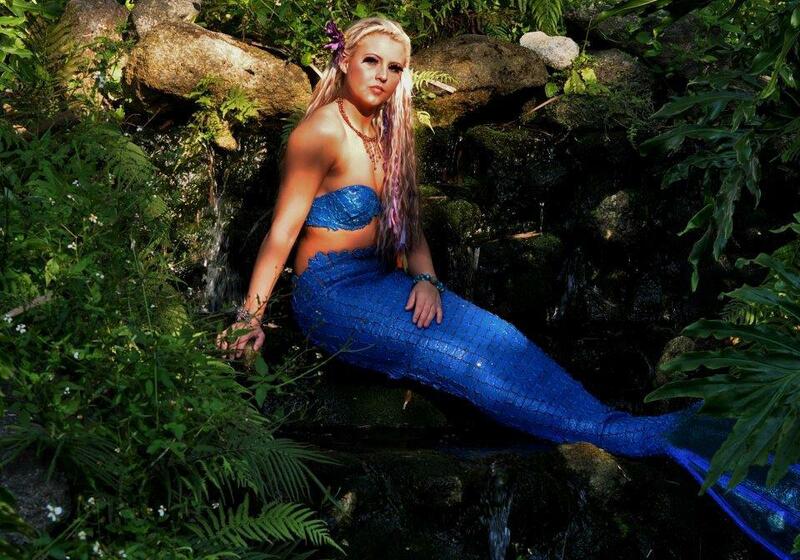 Our first face of Mermaid Minerals is Kylee Troche of Weeki Wachee. We put up the call for entries on our FACEBOOK page and got entries from all over the world! It was great to see all the beautiful faces of Mermaids everywhere. Professional & non professional mermaids entered as well as those who just connect or feel like a mermaid. We even had some Mermen enter! We chose Kylee for her spirit and her sheer enthusiasm! What a joy to meet her at Mercon this past summer. We are currently looking for the face of 2012! So all you Mermaids out there, go post your photo on our FACEBOOK page. The winner will receive FREE Mermaid Mineral make up and skin care for an entire year! Do you have any special mermaid products you want to talk about? Wow, how to choose just a few? I know I mentioned several during the interview but a few fan favorites include the NO STING NO BURN Natural Mystic Eye Make Up remover. It just takes off make up so quick and easy and is safe for contact wearers. The non-oily formula feels like water and works like a wonder! The other staple is NALU our day and night moisturizer for all skin types and can be used for face and body! It is packed with 9 vitamins, rare Hawaiian sea algae and smells like a fresh ocean breeze. Of course our LIMU seaweed cleanser (does not smell like seaweed, instead it is infused with orange oil and has a slight citrus scent) is a mermaid favorite. It is so creamy it can double as a shaving cream for mermaids & mermen! Get connected in a mermaid community. One thing I learned when I started Mermaid Minerals is that the love of mermaids is universal. I have Facebook fans from Turkey, Uganda, France, Spain & Egypt! 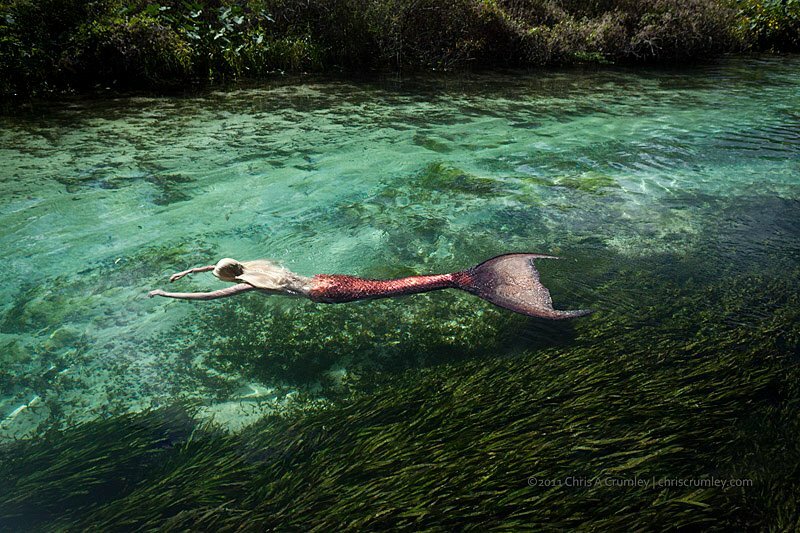 You don’t have to have a tail or live near the water to be a mermaid. I have a huge fan base in Las Vegas, Nevada! The desire to explore the connection to mermaids & everything mermaid transcends the ocean. The ocean connects us all anyway. 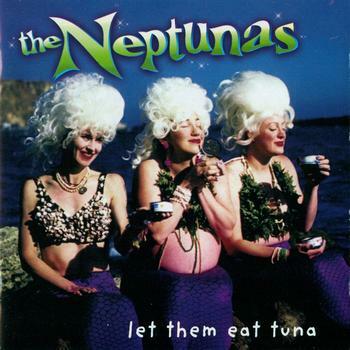 So THE NEPTUNAS were an awesome Los-Angeles-based all-girl surf istro band that was formed in 1994 and lasted till some time in the early 2000s and that was made up entirely of real-life mermaids. Fittingly, their songs have names like “Salt-Water Proof Mascara,” “Chicken of the Sea, “Nepton,” “Drag Stripper,” and “The Persistance of Surf,” and make you want to shimmy and wiggle in real mermaid fashion (even more than you usually do). Admit that makes you want to put down whatever lame thing you’re doing on this boring Tuesday and head to the beach. I know. To help ease your pain, recently I talked with the spectacular Leslita, the inimitable Pamita, and the fabulous Laura Bethita about the Neptunas and their general daughter-of-Neptune-ness. Our gorgeous and illuminating Q and A is below. Can you tell me about the Neptunas? Pamita: We started with Leslita, Toastita, Pamita and the mysterious Cathrinita who was only with us for a month or two and disappeared back under the sea. Later Laura Bethita joined the band. Laura Bethita: The Neptunas are mermaids with instruments. We are compelled to play our sea inspired songs to land lovers. How did/do mermaids figure into the band’s style and sound? Pamita: The Neptunas! We’re Neptune’s daughters! Laura Bethita: All our songs are ocean inspired in some way or another. It happens that way naturally. We play songs about what we know. As mermaids, we know the sea. Do you think that mermaids and surf music have a natural relationship? Laura Bethita: Absolutely. We do what is our natural desire to play songs inspired by our home….the sea. Can you tell me about the cover (and cover shoot) for Let Them Eat Tuna? Leslita: It was very cold. As I recall, I glued shells to brassieres to make the tops, and Pamita supplied the tails. Pamita: I was 8 1/2 months pregnant with my first son and I said, if we wear clothes I’m just going to look giant, so let me be a pregnant mermaid instead. So we decided to have mermaid tails made. Leslita made the shell bras and we rented Marie Antoinette wigs. The photo was taken down in San Pedro in a place called Sunken City. Laura Bethita: We actually walked pretty far in those mermaid tails and sea shell bras. IT wasn’t easy (although mine has velcro up and down the sides so I can actually open it up and play the drums). As Lesita said, it was a very cold day. As we walked down the street in those tails and wigs, folks driving by thought it was a parade. I suppose it was a parade of sorts. How would you explain the allure of mermaids? Pamita: We all come from the sea and we all remember being tiny fish children in our mother’s wombs. Laura Bethita: It is all about the sea with its beauty and its calming effect. Do you guys consider yourselves mermaids at heart? Leslita: Part hula girls, part mermaid. When I was 4, I had a grass skirt and grass/shell bra–my father made a home movie of me doing the hula. 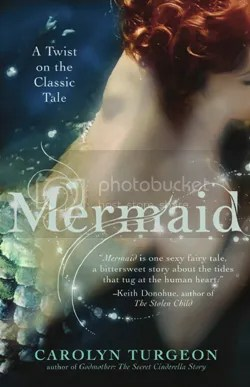 My favorite fairy tale was and is The Little Mermaid. The Hans Christian Anderson version, that is. Pamita: I am! I love mermaids. I love the ocean. Laura Bethita: Oh yes. I am a mermaid. Born of the sea. Do you have any favorite mermaid music… and/or any music recommendations for aspiring mermaids? Pamita: Don’t rely on prerecorded music = Play Conch shell solos yourself! Laura Bethita: The best music is about the sea. There are operas, rock songs, surf music, folk songs, etc. Anything about the sea is beautiful. Do you have any additional advice for aspiring mermaids? Leslita: Visit the little mermaid statue in Copenhagen—Langelinie. If they still have the Mermaid fest in Bodega Bay, that’s a great place to gather with your sisters of the sea. Pamita: Visit mama ocean often. Comb your hair. Lure naughty sailors to the deep. Laura Bethita: Aspiring mermaids…..get instruments and start right away. You don’t need to have learned skills, it’s inside of you. You will see. Just do it. Pamita: I’m a fortune teller http://www.madamepamita.com and I sometimes use mermaid cards and my mermaid costume for ocean themed events! A mermaid fortune teller!